Ashworth College, a leading online school, has introduced an online resource for those interested in firearms and the art of gunsmithing. Some of our graduates have turned gunsmithing into a successful second career... it [the Community] is an ideal place to pick up pointers from those already in the field. The popularity of some professions fade with the changing times. Once plentiful, blacksmiths, milliners, and coopers now conjure images of a time when tasks were done by hand and not by a machine. 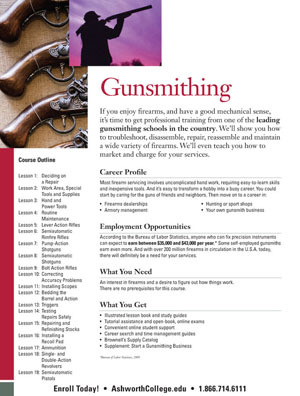 However, one skilled trade, gunsmithing, continues to draw interest from professionals and hobbyists alike, which is why Ashworth College (http://www.ashworthcollege.edu/), a leading online school, has introduced an online resource for those interested in firearms and the art of gunsmithing. Ashworth created its gunsmithing group within its online Community as a resource for those whose professions require the handing of firearms, for those who are simply enthusiasts and want to properly care for their gun or rifle, and anyone else interested in industry best practices, career insights, and invaluable information for relating to the art of gunsmithing. Ashworth’s nationally accredited online gunsmith training program is among its most popular programs and the Gunsmithing Discussion Group serves over 1,500 members (as of February 2012). The group is part of the larger 100,000 plus online Ashworth Community. “Federal statistics show that 50% of U.S. households have some type of firearm so it’s not surprising the Gunsmithing Group has a very diverse membership,” said Amy Bernard, Director of Interactive Marketing for Ashworth College. “The members range from enlisted military members, veterans and sportsmen to those working in numerous law enforcement and security professions, as well as consumers wanting seeking extra protection. A network of motivated and engaged students willing to encourage others by sharing personal, professional and educational insights and successes. Product recommendations for the latest firearms and licensing requirements are popular topics among members. Online study groups comprised of current Ashworth students enrolled in one of its educational programs. Members offer assistance with lessons and provide moral support to group members. Insights from students. Prospective students will benefit by learning from current students on what it is like to be an Ashworth student, how to be successful as an online student, and gunsmithing as both a hobby and a profession. 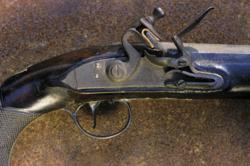 While the U.S. Bureau of Labor Statistics does not currently measure career statistics specifically for gunsmiths, O*Net Online, a website sponsored by the U.S. Department of Labor, does report that maintenance and repair workers collectively can expect average career growth, compared to other occupations through 2018 decade. “My entire family is into guns and hunting as well as a majority of friends. I have been doing repairs and cleaning for over 25 years now for the enjoyment and company. I plan to retire in 8 years and my intention is to have small home gunsmith business and possibly expand with family members if the demand for gunsmithing is great enough.” posted Darcy Z. in Gladstone, Canada. Headquartered in Peachtree Corners, GA, Ashworth is accredited by the Distance Education and Training Council (DETC). The Accrediting Commission of the DETC is listed by the U.S. Department of Education as a nationally recognized accrediting agency. James Madison High School is further accredited by the Southern Association of Colleges and Schools Council on Accreditation and School Improvement (SACS CASI). For more information, visit http://www.ashworthcollege.edu/.